He is a tolerant, quiet little child but sometimes acts sadistic. He only depends on the choices he makes and sometimes disobeys Darkwing. He’s the kind of guy to tell the truth ( but sometimes he goes straight where it hurts with the truth). He believes that if they all hear the truth then they will be all saved but …. he only hurts people with his truth. Born from a forbidden pairing between an angel and a demon, Gakary was born as a fallen angel ( a mixed blood angel) and is rare for his kind. He’s rejected by both Heaven and Hell. But he doesn’t seem to seek for revenge about this so he is just some dude. 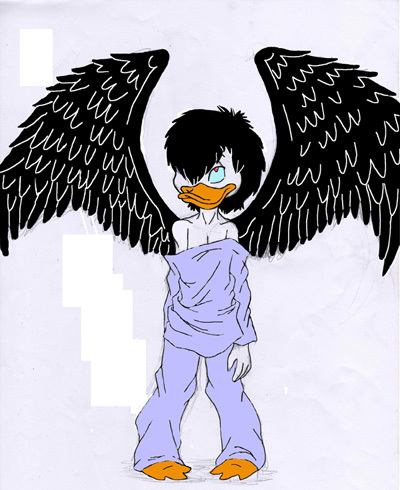 When the exorcist planned to kill all the fallen angels only Morgana had pity for him and made him work with Darkwing duck because the other fallen angels formed a secret organisation called D.C.C ( Dark.Cursed.Cross). They planned to take over both Heaven and Hell and the exorcist’s mission along with Morgana and Darkwing Duck is to stop them.Gakary might be the solution to the problem so he must be lead on the right path. But the problem is that Gakary doesn’t understand the meaning of crime and crimefighting because for him this is a theatre to amuse the demons and the angels (it’s big for him it’s stupid). But he will learn, and the gang will learn something about themselves that Gakary will tell.